Detection utilises the doppler effect, similar to traffic speed measurement. Detection is also possible with non-shielding material. For example, sanitary facilities could be covered with a single Sensotec in this way. Contactless switching prevents soiling. This rules out contamination with viruses or bacteria by the user. Detection in the close-up and long range depends on the reflecting surface, speed, and type of the object (person, animal, object, etc.). Metal frames affect the detection range. Extension of detection range through auxiliary units. Auxiliary input operation with rocker button. Requires an IR remote control to start up and set various functions. The sensitivity of the far-field detection is adjustable. Installation in a deep device box. Fulfils the specifications of the guidelines in VDI/VDE 6008 Sheet 3. 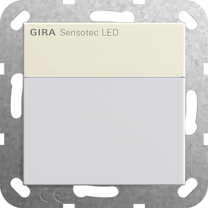 The Sensotec LED is an active motion detector. It detects motion in the detection range regardless of the temperature and switches on the LED orientation light based on the ambient brightness. Motion in the close range switches on the room lighting, for example. The switch-on brightness of the LED orientation light can be set. IR remove control is required during start-up and for configuring various functions.